I can't believe it's taken me this long to finally post about the great vintage clothing I got while in Los Angeles! I love love love vintage clothing, so when I was stumbled upon American Vintage on Melrose Avenue, I was in heaven. Pure heaven. I also got this style of ring in red. In addition to the rings, I also scored this great bag. It's leather and has tons of great pockets. It's huge and holds a lot of stuff. I've posted pictures with me carrying it but here's a picture of it by itself. Stay tuned for the second part of my vintage shopping! It's all of the clothing. Ooh, I love that first ring! that first ring is fabulous! Ooooh, I love that purse! 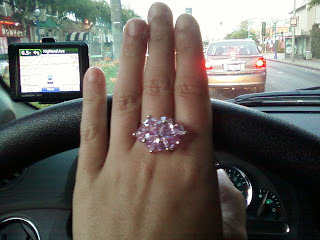 I love that first ring...it is fabulous!! Ah cute finds! I have never been to LA really.. I would die shopping there I'd officially be broke. Very cute stuff you got!!! I am SO in love with that pink ring at the top. Adorable! I love them! I got some cute stuff in San Fran too. Cali is just the place to go for clothes shopping! I really like that third ring. Vintage is totally amazing. I love all the rings and purse! I cannot wait to see what else you got!!! I watched The Hills last night and thought about you! LOL! Love the rings! 1st & 3rd are my favs. I'm an accessory junkie (you know, because they still fit if your clothes don't!) but have been slacking in the ring department. love the last ring!! great finds! I love that black ring. Love all the stuff you got! I have never heard of American Vintage, so I checked out the website. Super cute stuff. You mentioned that first time you went there, so I'm excited to see if got more stuff another time you went. I'm such a (vintage) ring girl! I love all of the rings you found... Sounds like it was a lot of much fun! Love the rings. 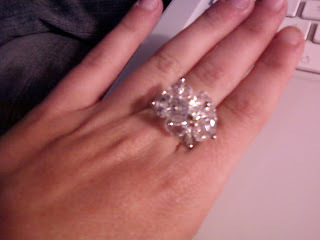 I'm a huge vintage jewelry lover! Yay!!!! 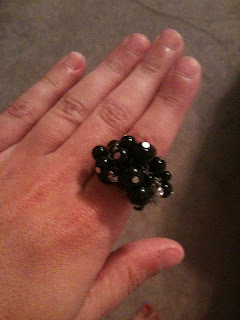 I love big rings, so fun!!! I do NOT have a knack for vintage shopping. But you found some great stuff! What great finds! 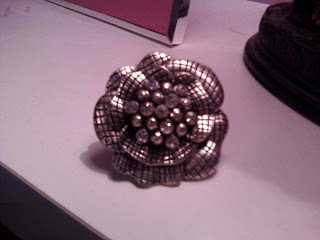 I love the chunky flower ring best! I LOVE vintage jewelry!! There is nothing better than finding something made for you :) I've got a few vintage pieces on my etsy site...check them out!